Bet you thought I went away for the weekend, huh?? No, I wish. Actually I spent much of yesterday taking care a sick pug. So while I was pug sitting, I was crocheting. The minute I saw this pattern I knew I had to make it. I dread sewing the squares together though, but the result is so fabulous, I will gladly overlook it. 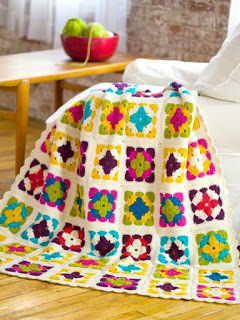 This is the "original" afghan and the pattern is here. It was published to coincide with Debbie Stoller's new yarn line. (Which is wonderful, by the way) When I went to the store to by the yarn, unfortunately all the colors were not available at the time. So I went with acrylic that I could get all the right colors in. After all it is about the pattern and the colors, right? These are some of my squares. I have about 8 more added to the pile after today and about 16 more to do. Then I need to go get the soft white yarn and begin the last row on each square and sew them together. I cannot wait to see the finished result. It really has been alot of fun crocheting again! Those squares are so cool. I need to learn to croquet. wow, wow, wow.